Dr Nitin Deshmukh is a Teacher, Researcher and Investor. Nitin began his investing career at the age of 15 and since then continues on as a life long student of Investing. Nitin is Programme Leader for the MSc Banking and Finance programme. He also teaches the Applied Corporate Finance module on the programme. Nitin joined Middlesex University Business School in 2012. Prior to that he was at Coventry University. Before joining academia, Nitin worked for several years in industry as a successful fund manager. Based on his industry experience, Nitin has developed two cutting edge modules in Equity Analysis and Fund Management, which he teaches on the MSc Investment and Finance programme. Students have consistently rated him as an excellent teacher. 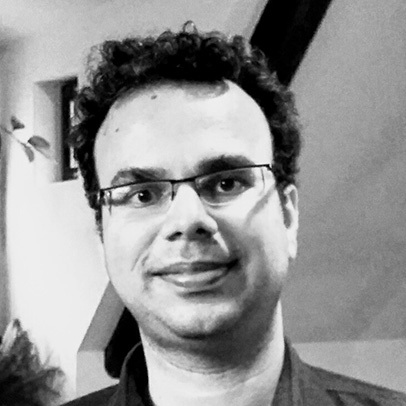 Nitin is an internationally reputed researcher and is currently supervising several PhD students and has served as an internal and external examiner for PhD vivas. Nitin also serves as a referee for various internationally reputed journals. Nitin has also served as an external reviewer for validation of the following programmes: BA (Hons) Finance & Investment, MSc Investment Management and BSc Finance. Importance of fund management company in the performance of socially responsible mutual funds (2017). Journal of Financial Research (ABS 3*). With Clark, E. and Belghitar, Y. Does it pay to be ethical? Evidence from the FTSE4Good (2014). Journal of Banking and Finance (ABS 3*). With Clark, E. and Belghitar, Y.
Dr Nitin Deshmukh is a passionate teacher who is very much liked and highly rated by his students each year. Nitin is best known for the Equity Analysis, Investment Management and Applied Corporate Finance modules that he teaches on the MSc Investment and Finance and MSc Banking and Finance programmes. These were specially desgined by him to be very applied and cutting edge. Over the years Nitin has taught several undergraduate and postgraduate modules within the Accounting and Finance department, as listed below. Corporate Finance, Research Methods, Financial Data Analysis, Finance, Portfolio Theory, Equity Analysis, Investment Management. Nitin is programme leader for MSc Banking and Finance. Under his leadership the programme has been redesigned to increase student engagement and satisfaction. This has resulted in continuously increasing student numbers every year. Nitin is consistently rated as an excellent teacher by his students. "Dear Dr Nitin, One of the things i always look forward is the advise you give your fellow students. Thank you so much for the support and being a role model to us." "Dear Nitin, Thank you very much for your time and patience. You have been a great teacher and we have really enjoyed all your lectures, your stories and your advice. Hopefully we will make you proud one day as successful investors." "Thank you Professor! It has been an absolute honour to be in your classroom this past year. I can honestly say you have influenced each of us enormously, me in particular. The knowledge we have gained from you on both, the market and life in general, has been invaluable. I feel that your class singlehandedly brought all of the acquired knowledge together and built our confidence. Thank you is not enough, but the word shall do for now." "Dear Nitin Sir, I would just like to say thank you for everything. I learned so much in your classes and I am so glad I received merits. There is no way I would have done it without you. You just did so much to help, and you are a great teacher. You have amazing patience with students; you’re fair, and you’re always willing to help. You are very thoughtful and you really put your time in to teaching your students, and you do it all, just for us. Thank you for sitting down with me always to clarify my doubts about modules and course works. It was so good to be educated by you. Wishing you good luck always." "Thank you so much Nitin for your support, encouragement and unique teaching skills you made the modules so easy to understand, I am forever be grateful and Monday evenings would have not been fun if it wasn't for your creativity. Thanks again." "Hello Nitin, Many thanks for making investment so interesting to us. Many thanks for your selfless support and bing there for us always. I am missing your lectures already." "Hi! Nitin Thank you for passing your knowledge to us, it is no doubt that you are the greatest and most interactive lecturer I ever came across. I am grateful and I believe others are too." "Hi Professor Nitin, Thank you for your kind and encouraging words. It has also been an honour for me to take classes with you. The way you encourage us to work towards success but at the same time obtain it through the right path is amazing. I'm very thankful for all the new knowledge and skills I learned." "Dear sir, It has been an amazing journey for me. From starting my BSC back in 2013 to now completing MSC which I have completed in 2017. Throughout this journey I have learned a lot of valuable lesson that has changed me into a better person. I would like to thank all my tutors, especially you sir. You were the most favourite tutor I had after a long time. It was always joyful in your lessons. I would like to thank you fo helping me understand all the lessons and for your massive support and motivation. I will always miss you. Thank you." "Hi Nitin, I would like to say thank you for all your support throughout my dissertation, lectures, but most importantly for your time and for your door what you always kept open to me not just for academical purposes but to talk about life." "Hello Nitin, It has been amazing having you as our investment lecturer. You have made it simpler for us and am proud to say you are a hero. Today I can boldly say I am an equity analyst cos you gave us the guide to become one. Thank you and God bless you in all your endeavours." "Dear Nitin, Thank you for teaching us in a very interesting and passionate way. Your lessons have by far been the most beneficial and favourite ones and will always be remembered in an very posisitve way." "Dear Sir, It is sad our MSc ended so quickly. We have learned so much from you and you have been a remarkable lecturer. We miss our Monday class, the wonderful lectures where each week we learn something new and interesting, the amazing coursework's that always encourage us to excel. It has been our privilege to be bless by such a wonderful lecturer like you. Thank you very much for all the patience, wisdom, knowledge and time you have devoted to us." "Thank you very much sir I am really Happy to have a teacher like you. May God always keep you happy along with your family where ever you are in life, and my prayers will always be with you sir. Thank you Sir!!" "Interesting discussions and real life scenarios and application. Lecturer breaks down info to be very digestible and builds up complexity once understanding is attained by student. Thoroughly enjoyed!" "I've been encouraged to learn more information and enhance knowledge. I like the way the lecturer presents both sides of the coin on the concepts we're learning, so we also get a realistic view of the theory." "Very good teaching. Lecturer makes teaching very engaging and interesting. Study is related to real life, how to apply in work and business. Assessments clear and explained well." "Interactive, very practical and real life examples. It was indeed very informative and encouraging to understand things in a easy and clear manner. Thank you Sir for making the module interesting." "This module not only teaches us the theory behind the course material but also gives us the practical examples and real life experience that the Professor gifts us. Frankly, this is the most interesting class in the Masters, and that is the general opinion of the class participants." "Teacher is enthusiastic and makes classes funny which helps keep us with attention to him and what he is saying. For me, as the module is something that I really like, I enjoy the classes, the environment. Every class I get more and more interesting in the subject and want to find and learn more about the topics." "Nitin has made the module very interesting, his enthusiasm made every one including me extremely engaged with his lectures/seminars. He really motivates me and I hope to carry on knowing him in the future. Carry on the good work Professor." "Good attitude while teaching, and always explaining with examples, makes this one (if not) the best module. Keep being the best teacher and making the class not boring." "Passionate lecturer, linking studies to real life examples. Very stimulating and inspiring." "Tutor is superb, couldn't have it any better". "Nitin has been a great teacher, gives practical examples and makes the class entertaining!" "This is the best Lecturer I have attended in my university experience. The lecturer was clear and precise in explanation and time management. Thanks Sir for the wonderful lectures." "Class was fun, interesting and lecturer kept environment open for discussion/questions. I thoroughly enjoyed the class and feel it really closed the learning loop of even other class/lectures. Best course ever! Keep up the awesome work. I am very grateful for all I've learned while in this course." "Module goes beyond the standard text book ideas and delves into the practical/necessary ideas that are essential to be successful in both the industry and our personal life." "Real life examples, very well organised structure of lectures. Very well assimilation of receiving knowledge." "The best aspect is to be able to link the lectures to real life situations while assessing possible solutions. So far it was exquisite!" "Keep Nitin, he is the best at what he does". "Keep being the best teacher ever, you inspire us to be better and keep learning." "Module prepares you for real life outside university. The skills we have acquired can be easily and readily transferable to life time scenarios. Good practical module, well executed". "The professor has been very easy and approachable in case of any need. Difficult things have been made very easy to understand. I was indeed very lucky to get an opportunity to learn from my professor - Dr Nitin Deshmukh - Thanks a lot!" "Nitin has been a great lecturer over the two terms! He really is great at his job and he cares for his students. He makes his class fun and very interactive! Nitin for the Win!" "The best aspect about this module is the tutor himself. He makes things and subject easy by his practical and day to day life examples. Through his coursework, we could practically explore the subjects. I just loved his interactive classes, we were actually involved during his lectures. Thank You! Sir"
"Dr Nitin you teach so good! Thank you!" "The teacher makes the lessons seem fun and interesting. If someone doesn't understand he will explain again in different ways to make them understand. Everything in this module is clearly explained at the beginning and throughout the course." "The module is clearly and well organised. Everything is explained well. Thank you so much Nitin for helping me and other students in class have interesting module." "The theory we discuss are always backed up with real life examples/events which helps the students to understand the topics even more. The lecturer is good, he is very informative in discussing the topics and very approachable whenever students needed help with their work/concerns." "The teacher is enthusiastic and explain very well the subject." "The teacher is great in teaching the module and covers topic in an intersting way." "The lecturer always makes sure the topic is well understood and gives good examples, also encourages browsing and learning new things considered crucial for our knowledge." "The lecturer has been able to make topics more interesting and has motivated me to improve." "Classical assumptions of investing concepts has been implemented with real life examples in an interactive way. The lecturer let us form different opinions and let us discuss our concepts during class which improves our objectivity." "The lecturer elaborates more on the topics from own experience. He made very good discussions in the class. I really enjoy the module and I'm looking forward for it everytime. I learn a lot new things." "The teacher explains very clearly and in simple terms. Thank you for the support. By far my favorite module." "Teaching engaged with students and module is fun. Very enjoyable. Wish I found the time to come to class more often. Thank you for your teaching Nitin." "Module is very interesting and engaging. Very detailed and useful in real life. Nitin rules!" "Lectures have a perfect combination of theory an practice. Lecturer encourages practical thinking. Use of real life examples and learning to critically analyse piece of news to me just teaches you to think like an investor or manager which is amazing. Current program contains really good structure and stimulates thinking that is to me the justification of the tuition money." "Module practically helps us to think as investors. I think it's good that the lecturer gives us life advices about investing, not only academically advices. It uplifts and encourages us." "Module is applicable to real life situations and well organised. Overall very good, with a lovely approachable teacher. The reason why I chose MDX." "We get a lot of examples from life. Very practical, always shows both sides of the coin." "The lecturer has made it very interesting and you feel like putting more effort." "I can use all the skill that has been taught me in the class in real life." "The lecturer has a good command over the subject." "The way lecturer presents module is one of the interesting module across other subjects and very stimulating to think." "We have been shared not only the theoretical part of this module, but learned a lot of technical parts as well which will be useful in our future jobs." "The lecturer is very supportive, he has always boosted us to achieve goals in life. Such lecturer should be in other modules as well, then only students can perform better. This is the best module in the entire MSc and I feel I have acutally learnt things that is going to help me in my life to achieve goals." "The best aspect of the module is the fact that we learn both academic theory and industry examples alongside." "Coursework is very challenging and requires practical implications and let us apply our knowledge. Mr Nitin is very good lecturer." "This module provides to me useful knowledge about investment that I've not heard before. The lecturer is really enthusiastic, humourous and knowledgeable on his field." "It is a practical module to the real world and the lecturer helped me develop and insight to equity and portfolio analysis. Nitin has made learning efficient. Thank you so much Nitin for such an amazing journey. It was lovely learning from you." "The design of the module is very good. We feel like real analysts to perform well and analyse the stocks." "The teacher teaches well and also I understand what he teaches. Well organised. Give the teacher a pay rise." "It is a very practical module and I am better able to understand how the stock markets work and what affects the stock market. The teacher has always given us useful examples when explaining, and his passion for the module is evident from his lectures. Overall a great module and fantastic teacher." "I have really enjoyed the class time with an active way of teaching. Nitin's enthusiasm and obvious joy about teaching makes the class very interesting and fun!" "Gives us sufficient info on how to carry out work." "Lovely very good Dr Nitin very nice." "Very good style of teaching, energetic, full of activities and exercises as well as discussions." "Lectures are enjoyable and well presented. Lecturer is excellent at getting his point across. Always motivates students to contribute to class." "Nitin explains the complicated topics and issues in a very simplified manner. Thanks for Nitin for being so encouraging." "Module is very interesting and stimulating. It is very realistic as it helps us to become and start to think like an analyst. Well structured lecture and presentation. Power point/lecture slides uploaded on time. It is been a great pleasure attending your lecture. I feel motivated to come and attend your lectures." "Atmosphere in the class is very good as we are all engaged and motivated to great job thanks to Nitin. The best lecturer I ever had!" "Nitin makes the module interesting, is an excellent lecturer, has passion for the module. More modules should be present in the same structure. Nitin should teach core modules." "Dr Nitin is best aspect of this module. Because his tries to explain concepts increasing way, and makes sure he don't make you feel embarassed if you have asked a stupid question. Last but not the least he is willing to share his knowledge and experience so that we can learn from it." "Nitin is respectful to the students and treats us as equals. He is enthusiastic about the subject and connects it to the real world (our future jobs). He is high quality in every way! His approach to prepare us for getting jobs is very good." "The lecturer has a passion for the subject and you can feel it. The topics taught in a very simple and enjoyable way which helps you understand the content and remember it. Learning the content by using the varies theories in coursework makes you understand everything much better - the best way." "This module built the qualities of being and investment analyst and cover all the strategies on the market. I have gained knowledge about the market trends of investing and investor behaviour. The module leader Dr Nitin Deshmukh has been very supportive and guided us throughout the module and I am confident of getting the best out of this module. I wish other modules to be more practical based real life study so to deal with cases in a better way. Thanks!!" "The lectures are fantastic. Nitin is a very good lecturer because he has been able to make simple things that are difficult." "All the concepts has been explained to us in simple terms and with lot of examples making it very interesting. It is perfect. Best module in the entire course." "Nitin has excellent knowledge about finance, clarity on doing things and doing them at the right time. Needful help whenever needed and proper directions." "The teacher was really great. He explained everything clearly and practically. Happy student :)"
"Very good lecturer, always there and ready to help. He makes subject interesting by giving recent examples and make sure we understand the subject before moving on." "The topics covered are very useful for our career. The course-work helps to put in practise knowledge and get idea, how things are actually done in real life. The module involves a lot of discussions, so you are always engaged and, thus, learn and think more. I really liked the module as the topics covered were very easily explained. If something was unclear, it was always possible to ask questions or for additional explanaition." "We learnt how it works in real life by using practical examples and coursework related to real life analysis about companies." "The module is well structured in an easy way to understand. It is really interesting to be in this class. So far I really enjoy this module more than the others. It is quite good and I don't see anything which need to be improved." "Nitin has ability to understand the knowledge of each student and teach in that direction. The way he teaches this subject is the best aspect of this module. Very happy with this module and teacher." Dr Nitin Deshmukh is interested in research related to the field of Investing. He has published papers in world leading journals covering issues related to the Financial Performance of Socially Responsible Investments. Nitin is presently supervising several PhD thesis in the areas of Risk Management & Tourism, Mergers & Acquisitions and Exchange Traded Funds. Nitin is also currently working on papers in the areas of Marginal Conditional Stochastic Dominance, Portfolio Selection and Value Investing. Nitin has several years of practical experience with Equity Analysis & Fund Management, which feeds into his academic research. With Clark E, Kassimatis K and Guran B (2017). ‘Index Tracking with Utility Enhanced Weighting’. Multinational Finance Conference, Bucharest. With Clark E and Belghitar Y (2016). ‘The Ethics Premium and the Fund Management Company: The Performance of Socially Responsible Mutual Funds’. Multinational Finance Conference, Stockholm. With Clark E and Belghitar Y (2015). ‘Does Active Ethical Investing Pay – Evidence from the UK’. International Conference on Finance, Athens. With Clark E and Belghitar Y (2014). ‘Does Active Ethical Investing Pay – Evidence from the UK’. Multinational Finance Conference, Prague. With Clark E and Belghitar Y (2013). ‘Does it pay to be Ethical? On the Contrary!’. Multinational Finance Conference, Izmir. With Clark E and Belghitar Y (2012). ‘Does Passive Ethical Investing Pay – Evidence from the FTSE4Good’. Financial Engineering and Banking Society Conference, London. Deshmukh, Nitin (2012) Performance of ethical equity investing in the UK: active, passive and criteria. PhD thesis, Middlesex University.